This super salad is packed with chicken breast, shredded red cabbage, tossed with carrot, coriander and sesame seeds with homemade turmeric almond dressing. An anti-oxidant rich salad base of colourful red cabbage and carrot, massaged for ultimate digestion, allowing you to absorb all of these nutrients. Topped with fresh avocado which is rich in healthy monounsaturated fats, making them the ultimate beauty food that is a must eat for lush hair, skin and nails. Drizzled with a golden glow dressing made from anti-inflammatory spice turmeric. This golden root is famed for its health and vitality inducing properties and when you look at the bright orange colour, it’s no surprise! To prepare the slaw, place cabbage in a large bowl with salt, olive oil and vinegar. Using hands or tongs, massage the cabbage to break it down a little, until it reduces in size and becomes glossy. Add in the coriander, and sesame seeds and toss to combine. 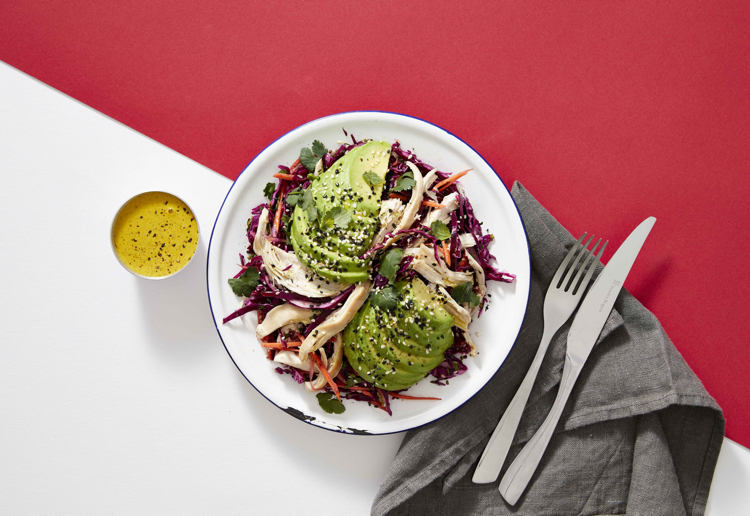 To serve, top the slaw with chicken breast, avocado and an extra sprinkle of sesame seeds and coriander. Serve with dressing. This is honestly such a great salad. Packed with nutrients! Lovely! A perfect recipe for our warmer weather,just lovely! I do love a salad with coriander, cannot wait to make! You got me with the coriander – super looking salad! The avocado completed the deal for me!